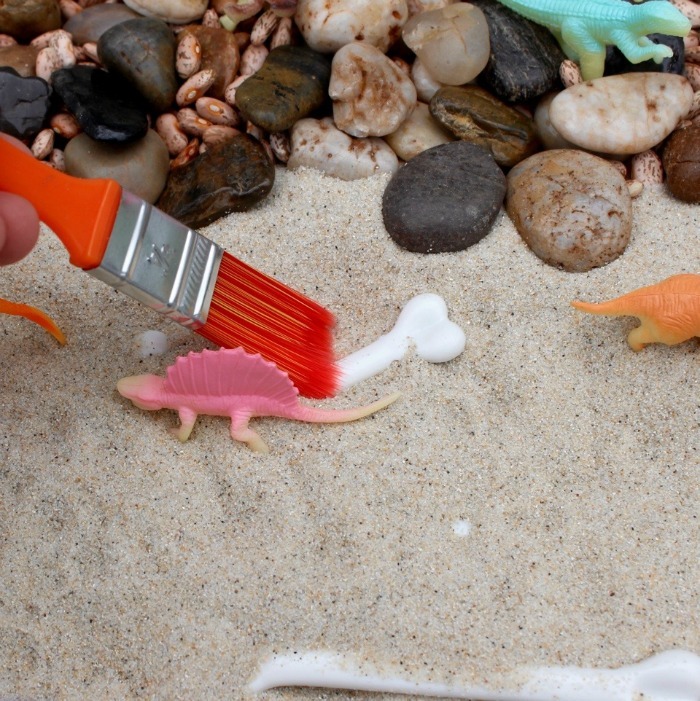 Do you have a dinosaur-loving kiddo in the house? 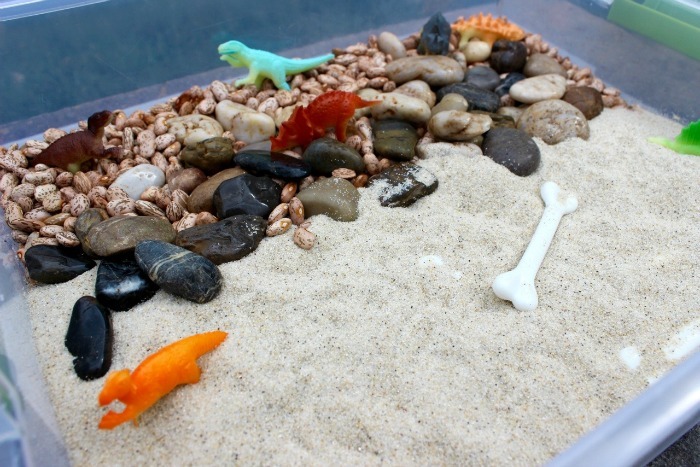 Then they’re going to freak over this fun dinosaur sensory bin! 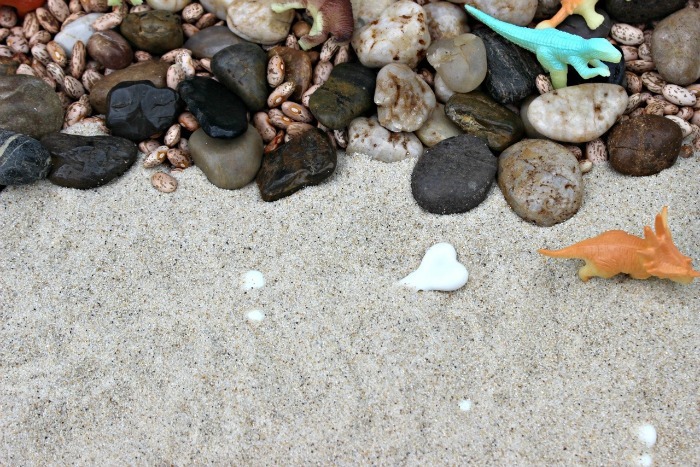 Today, Tricia of The Good Mama shares the dinosaur sensory box her own toddler can’t get enough of. I don’t know what it is about dinosaurs, but my toddler has recently become OBSESSED. There are dinosaurs everywhere! Sticks are dinosaurs. Trucks and cars are dinosaurs. I mean, I wouldn’t be surprised if my toddler started to turn into a dinosaur. He’s always stomping around scaring his baby sister with his T-rex growl. Fortunately, I’ve noticed he’s not alone with his dinosaur fascination. We are constantly running into other toddlers equally enamored with our extinct predecessors. Since I’m fairly certain I’m not the only one tripping over an apatosaurus’ long neck or shrieking whenever I sit on a stegosaurus’ sharp spikes, I decided to embrace the dinosaur fever. 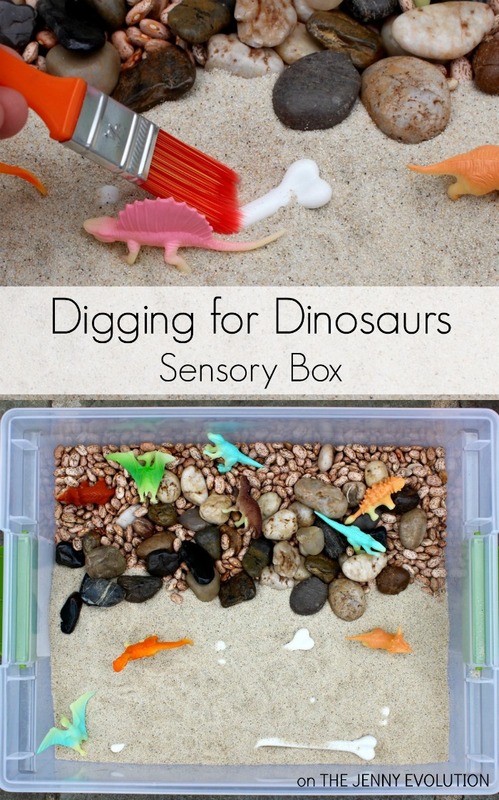 I created a simple but fun digging for dinosaurs sensory box. My toddler went crazy for it, and ended up spending most of the morning letting his imagination run wild digging away. This sensory box is very easy to put together. Plus, if you already have a bunch of dinosaur toys scattered around the house like we do you’re already halfway there. 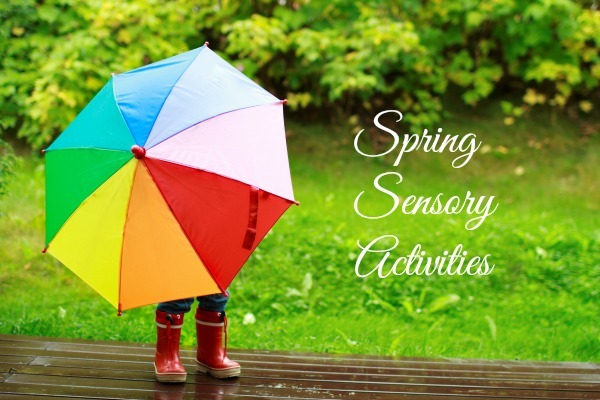 This sensory box is a great way for your toddler to work on their fine motor skills. It’ll also encourage your toddler to use his imagination. This post contains affiliate links. This one’s is real simple! Just add the materials, bury some of the bones, and give your toddler free reign. With permanent marker, write numbers or letters on the bones. See how many numbers or letters they can identify after digging them up. 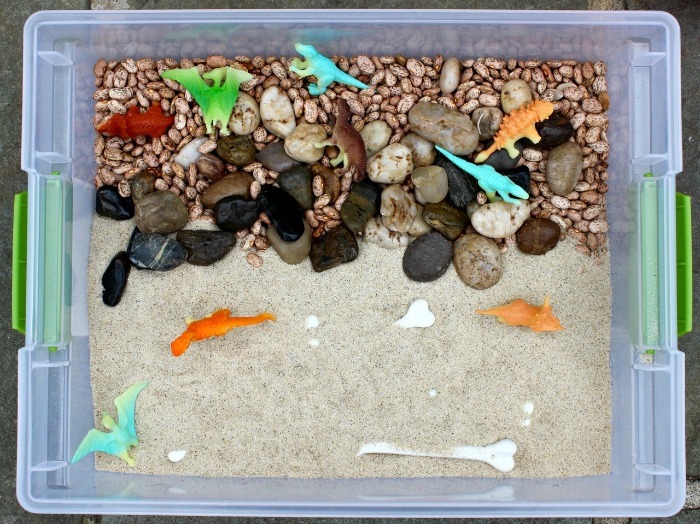 Your dinosaur-loving toddler is sure to have a blast with this Digging for Dinosaur Sensory Box. About Tricia: Tricia is a first time mama to a fun-loving, sleep-hating one-year-old boy. After teaching in elementary school for several years, she decided to stay-at-home with her son and very rambunctious puppy. Tricia likes to write about fitness, food and all of the fun activities her family enjoy doing together. You can read more from Tricia at The Good Mama.